We highly recommend that if you are on the latest major versions, you upgrade to these maintenance releases. We want to wish you all a very happy holiday season and new year. We value our customers and your support for our products. You allow us to continue doing what we love, and that is crafting great software. We are excited to bring you more new products and features in 2013. See you on the flip side! 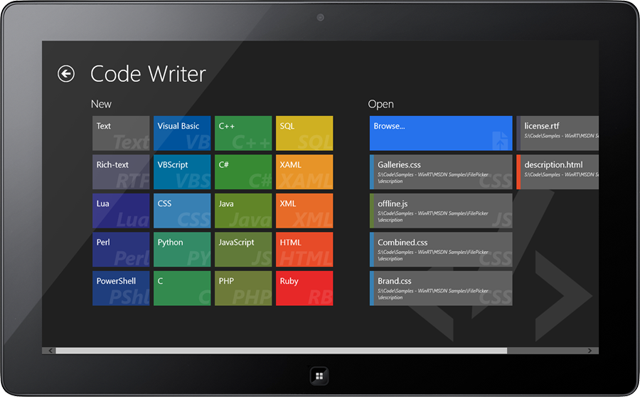 Today we published v1.3 of Code Writer, our free text/code editor app, to the Windows Store. Code Writer was first released last week but has already gained a tremendous following and is rapidly climbing up the daily rank charts. Yesterday we hit #23 in the "Productivity, Free" category! Please continue to help it grow in popularity by spreading the word to your colleagues. We've been watching the posts in our forums and in the Store reviews and have delivered on the top requests. This is a very exciting release so let's take a peek at what's new. 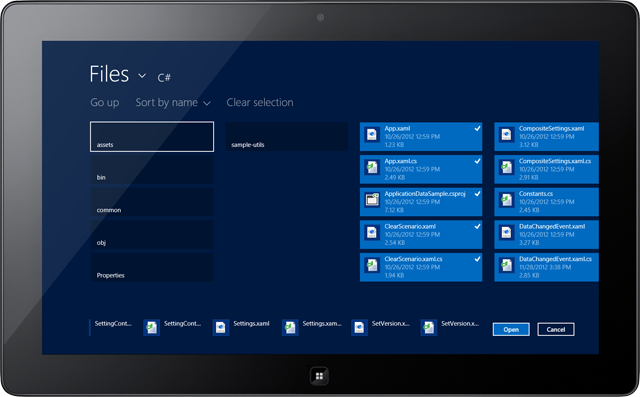 File associations have been added to all the built-in file types. This allows Code Writer to be registered as a possible default application for the various supported file types when you open files in the Windows desktop or other apps. We've also added some very nice looking icons for the file types when you choose to register them with Code Writer as the default application. A new detail flyout for each file type has been added that lists all the pre-defined file extensions. 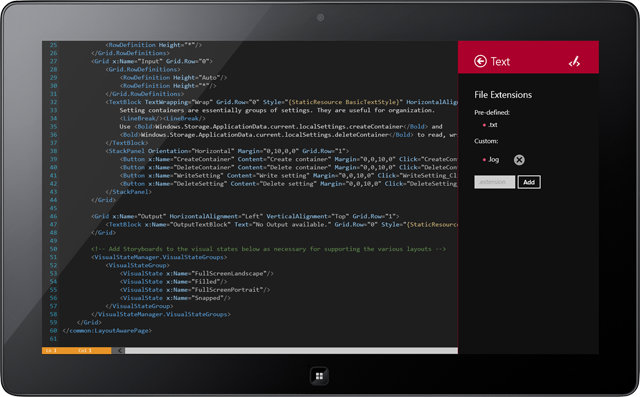 It also provides the ability to add custom file extensions for the file type. In the screenshot above, we've added ".log" as a new custom file extension for text files. This lets the Browse picker open .log files. Speaking of the Browse picker, now you can select multiple files to open. Navigate to a folder, hit the Select All button and open every file in the folder. A new Document Properties pane has been added that shows a larger view of the filename and path. It contains a drop-down that allows you to change the file type associated with the current document only, which normally defaults to a file type based on the file's extension. The pane also displays some helpful statistics like total line, character, and word counts. The Go To pane allows you to enter a line number and jump directly to it in the editor. 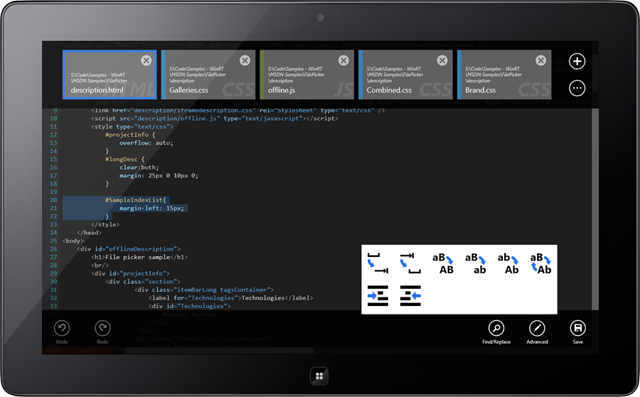 Code Writer has a large Settings area where you can customize things to your liking. New in this version is the option to change font family, with built-in font preview. This new version adds some very nice enhancements to the app. If you like what you see, please click the button below to go download it and write some code on your devices. In our last post, we introduced our new free Code Writer app, which is a text and code editing application for all Windows 8 devices, including ARM devices like the Surface RT. Code Writer uses a work-in-progress port of our SyntaxEditor code editor control to the WinRT/XAML platform. 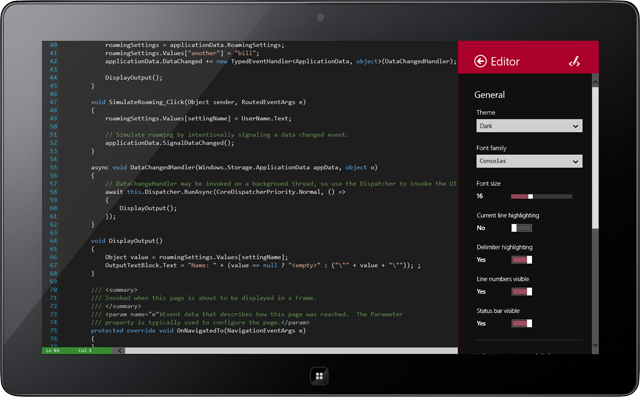 Following the design methodologies for Windows Store apps, we've made the Code Writer editing experience completely chromeless. Everything is hidden from view by default while you are editing your document. We do however show current line and column status right within the horizontal scrollbar area. This is important info that you always want to see and doesn't waste any valuable space by being in the scrollbar area. You'll note the orange background for the line/column display. As mentioned in our previous post, we've designed our app to use color to create a bond between you and the various file types you work with. If you peek at the last post, you'll see that on the Add Document screen, the HTML document file type has the same orange background. While we're editing a HTML document in the Editor screen, the same orange color subliminally tells us that we're in a HTML document. This is useful when Ctrl+Tabbing through documents. You may be asking, how do I access other documents and editing features with a chromeless UI? You simply swipe down from the top (or up from the bottom) to show the app bars for this screen. Pressing Windows+Z or right-clicking does the same thing. Simply click on a document to switch to it. Right click options are available as well with features like Close All But This, etc. Click the "add" button on the upper right to access the Add Document screen (also available via Ctrl+N). The bottom app bar has access to editing features. One interesting feature is the popup gallery of advanced edit actions. This gallery will grow over time (we already have more features coming in the next version). It allows quick access via large touchable buttons to features like tabify lines, convert case, indent, etc. Code Writer has a very polished and unique design for a text/code editing app. And it follows all of the Windows design experience guidelines, making it fit right in with other high-quality apps for the platform. It is available in the Windows Store now. If you like what you see, please click the button below to go download it and write some code on your devices. 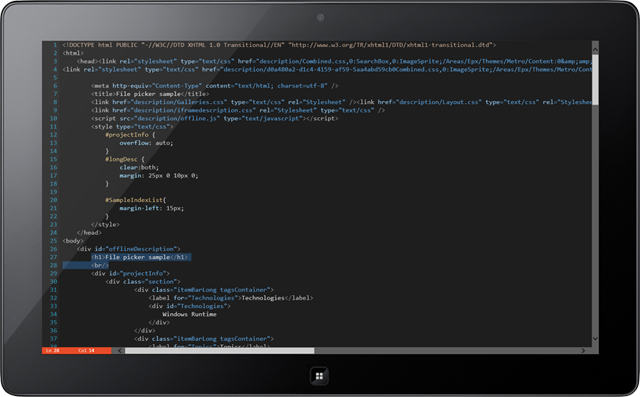 In a previous post we took a look at our SyntaxEditor syntax-highlighting code editor control being run in a WinRT/XAML app on a Surface RT. This port of SyntaxEditor from our WPF/Silverlight versions is still work in progress and isn't available for sale yet, but rest assured it's coming. 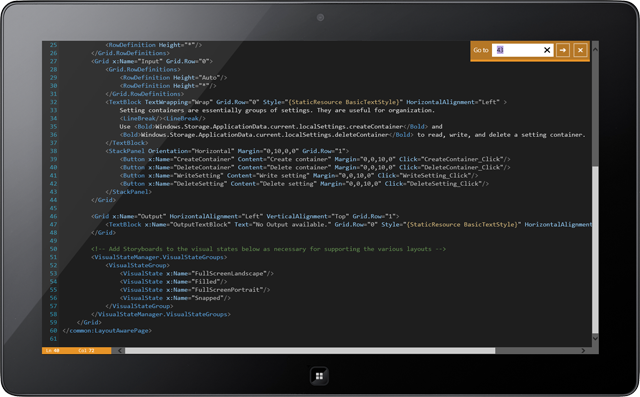 That being said, let's dig into the new Code Writer app that was just released on the Windows Store, which shows the future SyntaxEditor for WinRT/XAML control in action. Code Writer is a free text and code editing application designed specifically for Windows 8 devices. It runs on any device, including desktops and ARM devices like Surface RT. We've built it from the ground up to be fast, fluid, and powerful. Active syntax highlighting updates as you edit files, with 20 file types supported. Multiple documents may be opened at a time. Use an intuitive tabbed document interface from a slide-down app bar to switch between documents. Browse to open any accessible document, or reopen recently-opened documents with a tap. Color is used pervasively throughout the app to create a bond between you and various file types. This is just a first glimpse. Jump over to the Windows Store and try it for yourself. If you have any suggestions or problems, please post them in the dedicated forum for the app. We'll dig into more features soon. 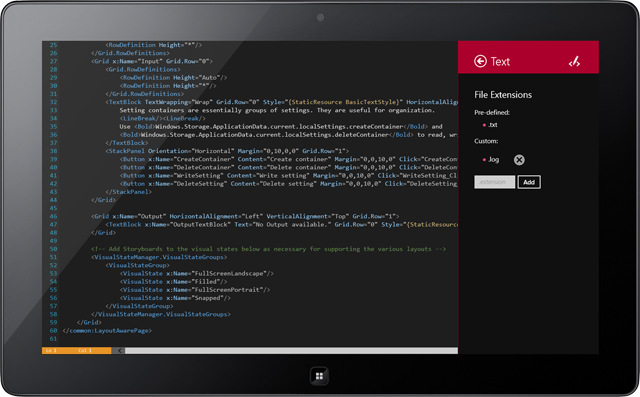 And if you would like to add similar code editing features to your own apps, please check out our SyntaxEditor control, currently available for WPF, Silverlight, and WinForms. 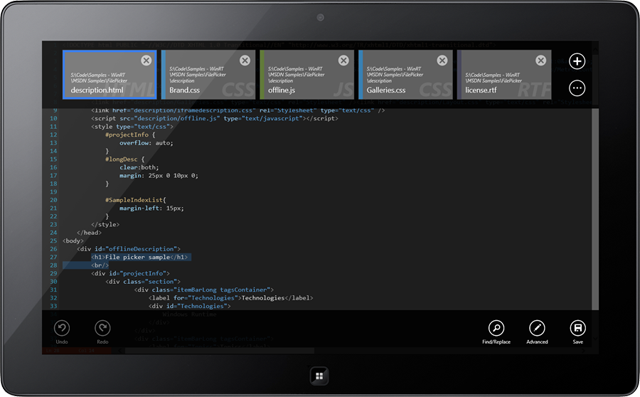 As mentioned above, it will be available for WinRT/XAML in the future too.